After watching the awesome 1981 film Heavy Metal again and introducing it to my 15yr old son (who thankfully thought it was as cool as I do! ), I was inspired to represent the Loc-Nar in a new story. Maya, Redshift, several World Machine terrains, a few greebles from KitBash3D, some textures from Megascans and then I did the unusual thing (for me) of some hardsurface modeling. I blocked out a ship and some helmets/gear in ZBrush then modeled them in Maya… I’m very far from a good modeler of such things, but was fun to use the new(ish) Modeling/UV Toolkits which have really simplified things! I also incorporated a couple of the new VDBs that we’re putting together for a new Gnomon Workshop tutorial/library on using Houdini to create smoke/fog/etc. Coming soon… :) Lastly I experimented a bunch with different tools/plugins for grading… Aurora, Topaz, Magic Bullet and also tried out Optical Flares from Video Copilot. All cool in their own ways… In the end it is mostly Photoshop, lots of AOV (Redshift render pass) tweaking with a mix of Camera RAW and Aurora. Final image is 8k, but unfortunately I can’t share that here… :/ Don’t touch the Loc-Nar… bad things happen. Just started using MASH in Maya 2017 this week and it is really cool! While it is marketed as being a Motion Graphics tool, it is ultimately an amazingly powerful object instancer/duplicator. This is my first test with it and basically... I don't think I'll be needing to use EITHER particle instancing OR the SPpaint3D script anymore. Which is awesome. i.e. MASH has geo paint built-in which is ultimately way more powerful than SPpaint, while its instancing tools skip the need for writing particle expressions on custom attributes, caching, runups, etc. Another big plus is that instanced objects on a surface, by default, orient themselves to the surface normals, which is why I used grass for my first test. While this was doable with particle instancing, it required a hefty and slow to calculate expression. Anyhow... going to be a big time saver while making the process much more fun! I've also been building a library of World Machine assets that are ready to import from a Maya shelf, primarily for when I need Mountains/etc in the background. This image was the result of importing one, adding some Megascan materials (which I also have on a shelf ready to go), importing my water plane (on a shelf as well) and... quick island image! New personal work to test out Redshift with a relatively heavy scene, as well Redshift proxies. As one would expect the interactivity of IPR did slow down, but easily managed by using display layers to hide/show objects. Render time for 4k was about 90 minutes with dual Pascal TitanX cards, although I did crank settings higher than likely necessary since it was for a still. This is still super fast, especially since both 3D fog and DOF are on! I'll note that the DOF is what requires higher sampling, so if I were to do the DOF in post the render time would likely be cut in half... 45min for 4k? Pretty darn cool for a scene like this... I still haven't played with Redshift's AOVs, so this is a straight 32bit EXR render with just a little tweaking in Photoshop with the Camera Raw filter. I also set-up a bunch of Megascan materials that are ready to go for future projects, using several of their rock and leaf materials for this scene. Anyhow... has been a great experience so far switching over to Redshift and GPU rendering! A couple weeks ago I decided to try out GPU rendering. After doing some research and talking to a few people, I was steered towards Redshift. Several studios have been using it and it seemed worth trying out. Was simply curious. A couple years back I switched from Mental Ray to V-Ray and the idea of converting my library of assets, again, was not super appealing. But, fun to try something new nonetheless. Anyhow, after a weekend with Redshift... holy $@#*! Running on a single 980 card it was insanely fast. 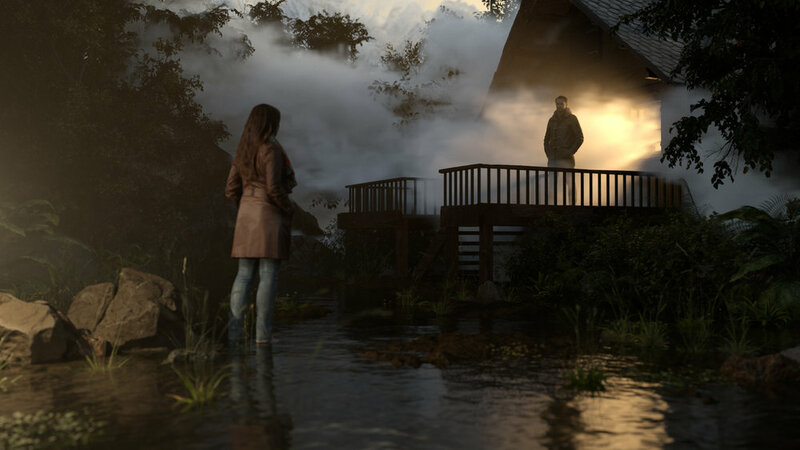 IPR became useful for complex scenes including fog and DOF, seemingly about 10x faster than Vray. And easier... less fuss to manage sampling as the speed allows for the use of high rates and Brute force. And a bunch of other things but to sum up. It is cool and I've 100% switched. Just spent a couple weeks converting my library. Also upgraded my machine from a single 980 to dual TitanX cards. Yay for nVidia... and Redshift! And... I have a YouTube page. Added some misc animations as well as an entire tutorial on the making of Dirge: a lecture from the Gnomon Workshop. Still not much there for now, but hopefully I can record some more casual tutorials and things to put in there if time permits. Ultimately there are some things I'd be happy to share in regards to process that don't really need to be an 'official' Gnomon Workshop title. So we will see... but for now... it's a start!